Alphachimp graphic facilitator, Jim Nuttle, got a great shout out from speaker, author and agent for social change, Kevin Carroll. 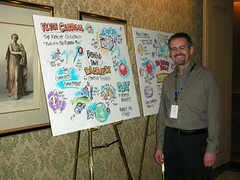 These amazing drawings of my presentation were done by a graphic facilitator, Jim Nuttle from Alphachimp Studio, Inc. He was a member of a team of artists who captured the entire Nursing Leadership Congress (in Chicago, IL) sponsored by McKesson Corporation, via illustration. Jim & the Alphachimp team created a wonderful way for the attendees to view their work/ideas in a much more dynamic manner - much better than reviewing "traditional" meeting notes.